Even though summer hasn’t officially started, we thought it’d be nice to show (tease) you with some of the great stuff coming in for fall. Let’s admit it, ultimately, San Francisco is a city of cold and wind and rain and everyone who lives here basically has a desire for cozy, warm, layered things hard-wired into their DNA. 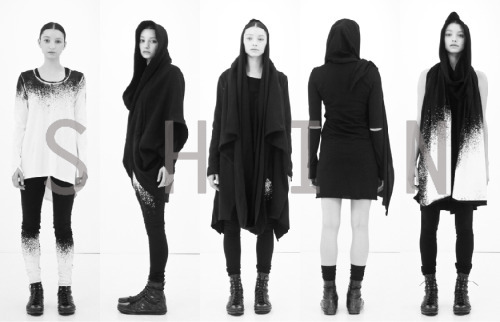 Judging from the nearly empty racks, we can tell you guys loved SHIN’s first collection that we got for spring. For fall, SHIN is sticking to her restricted color palette of blacks and whites, but the clothes are the furthest thing from severe. Tops drape effortlessly and have tiny quirks like cut-out slits and layered construction. Dresses feature deceptively simple shapes that go from casual rock to cocktail chic almost instantly. For fall, the bottoms will feature a gorgeous airbrushed ombre graphic. But the outerwear — well, let me tell you about the outerwear: slouchy silhouettes, soft fabrics, and carelessly elegant drapery will prove just how versatile (and absolutely desirable) black can be. If you’d like to be notified of when fall deliveries arrive, feel free to send an e-mail to info@shopacrimony.com with “SHIN fall 2010” in the subject line. We’ll send out an e-mail the moment it gets to our doorstep and you’ll be the first to know!